Who doesn't get excited when there's free/complimentary items?? Whenever I hear the word "free", my eyes will sparkle! Hahaha...freebies, free food, free gift, free-flow, free entrance, free time & even free money :P Fwah...FREEdom!! Me likey! Room Service, a Food Runner company that does food delivery has been in KL for 11 years now! 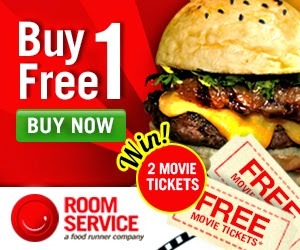 To celebrate 11 years of success & the excitement of Malaysians with freebies, Room Service is having a One-For-One promotion to reward their customers with not just a free meal (burgers/pizzas), but customers will stand a chance to also win a pair of free movie tickets to watch The Equalizer, starring Denzel Washington and Chloë Grace Moretz with their loved one! It's a great deal not to be missed! As per all promotion mechanics, the more entries you have, the higher your chances of winning! Don't wait any longer as the promotion ends on 30th September & the winners of this promotion will be announced on 1st October 2014 via Room Service's online newsletter, Facebook and email. Enjoy the food & all the best in winning the movie tickets! One promotional item PER ORDER only, valid until 30th Sept, 2014. These offers are valid for online and mobile app orders only. These offers cannot be combined with other offers, promotions & is not exchangeable for cash. Customers must reside within the delivery areas to enjoy the offers. Minimum order of RM20 is required. Room Service reserves the right to amend the items / prices on the menu without prior notice.